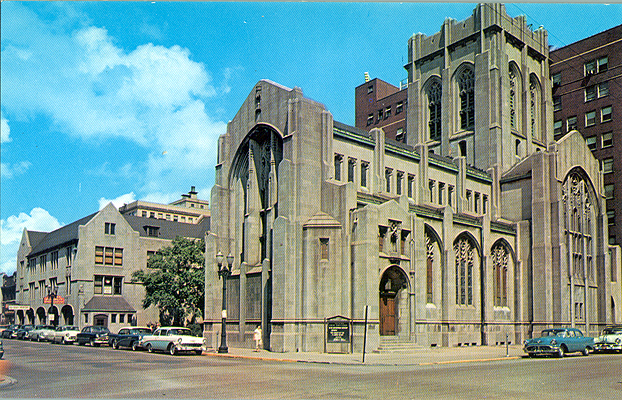 Photo: City United Methodist Church around 1955 (source). Photo: Current view of City Methodist Church. Photo: View of the church Sanctuary (where the altar is) in 1967 (source). Photo: The Sanctuary still whispers of God’s glory. City Methodist’s flock of worshippers were graced with a progressive pastor who held that people of any color were God’s Creation. Pastor William Seaman invited African-Americans into his congregation at a time where blacks where not welcome in “white churches.” Pastor Seaman took also public stand against racism in Indiana and was able to prevent the screening of Birth of a Nation, a film that glorifies to Ku Klux Klan. Photo: Taken by Nick Forslund. At its height the church had about 3000 members, but by 1973 it only had 300. In 1975 the church closed its doors to the congregation and the property was sold to Indiana University. IU did not utilize the property and today it is owned by the city of Gary. 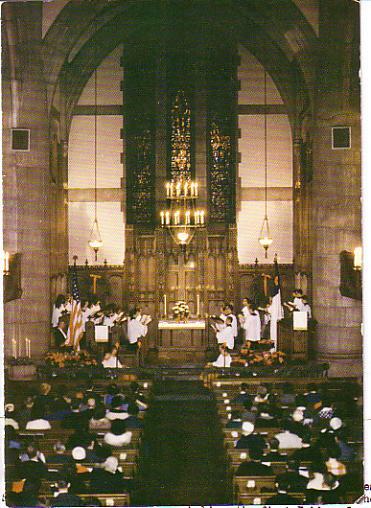 The church was populated briefly by another congregation in the 1980’s. The Great Gary Arson of 1997 destroyed much of the building, in particular the third floor gymnasium roof. In 2009 the building was used to film the Nightmare on Elm Street remake. 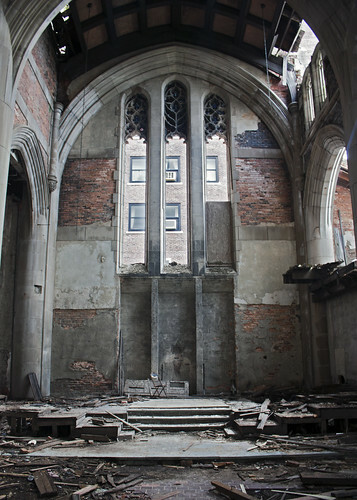 The church was also used in August 2010 as a location for Transformers 3. Demolition efforts sporadically arise and immediately fizzle out as the city of Gary struggles to find funds. Photo: Take a seat and have a long chat with God. We arrived at City Methodist first thing in the morning on a Saturday and the church was already populated with photographers. There were even professional photographers using the church as a backdrop for wedding photos. The entire wedding party mulled about as the bride and groom captured the moment. The bride even climbed several flights of dirt covered stairs and through tight spaces with her wedding dress hiked up. The whole experience was quite surreal. 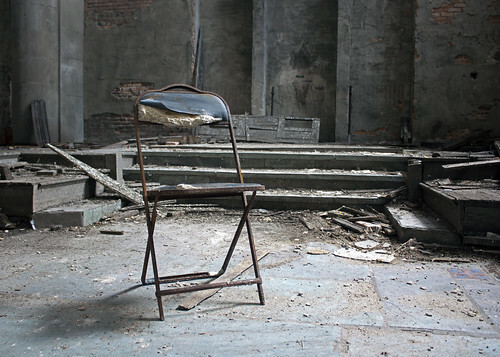 I had become accustomed to the isolation that urbex provides in densely populated cities. City Methodist Church was originally built to be a community center with its large auditorium, storefronts, gymnasium and school. Despite being closed the church was still very much an active community center. 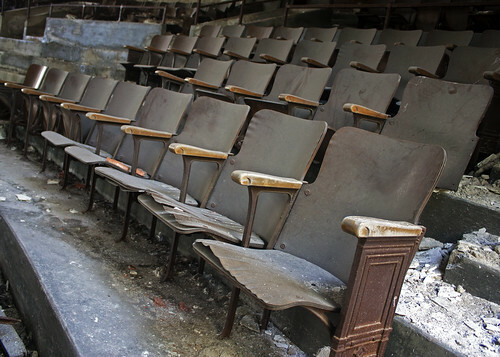 Photo: Seating in the auditorium balcony. The other photographers who were there talked about how the next week the location was going to be used to shoot Transformers 3. There was concern that after the shoot the filmmakers would finance the demolition of the building. 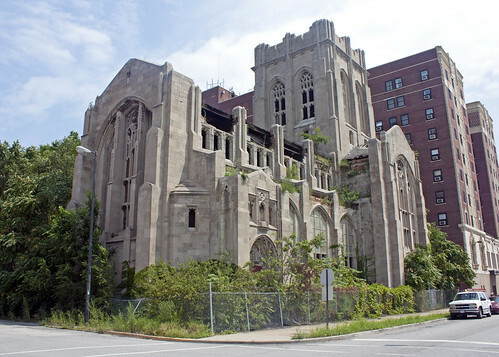 The city of Gary was paid a grand total of $1,550 for the rights to shoot at City Methodist… I don’t think demolition is going to happen any time soon. Given the volume of off the street visitors to this location it is only a matter of time before statistically someone seriously hurts themselves. I am glad I had a chance to visit it before its inevitable demise. It really was a beautiful building, but something about it’s popularity did not sit right with me. 1967 City Methodist Church Directory has photos of church members. 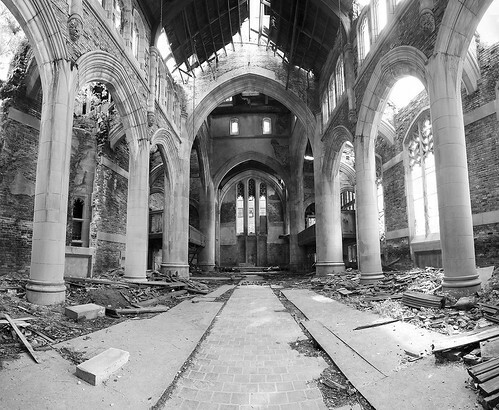 Fantastic gallery of b&w photos of City Methodist in its prime. Information about the Skinner Organ at City Methodist. 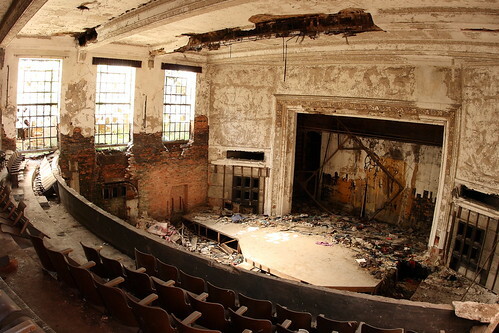 Historic Buildings of Gary, Indiana has some great winter photos. Video taken inside of City Methodist. Transformers 3 article on nwi.com. Nightmare on Elm Street article on nwi.com. Thank you for attaching the 1967 Church Directory. I was the Senior Pastor’s Secretary and there are two very funny pictures of me in it.. both at my desk. what a tragic shame. Gary Indiana was 2nd only to Pittsburgh in the steel industry. US Steel shut down their big furnaces by 1980 and the city never recovered.Michael Jackson’s father supported his family with a paycheck from the Gary Works.